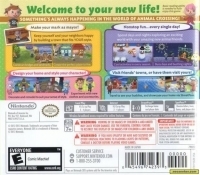 Box Text: Welcome to your new life! SOMETHING'S ALWAYS HAPPENING IN THE WORLD OF ANIMAL CROSSING! Make your mark as mayor! - Keep yourself and your neighbors happy by building a town that fits YOUR style. Design your home and style your character! - Decorate and remodel to suit your sense of style. Experiment with new clothes and accessories. Nonstop fun... every single day! 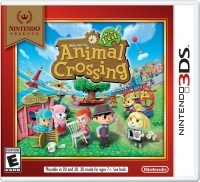 - Spend days and nights exploring an exciting world with your amazing new animal friends. Visit friends' towns, or have them visit yours! - Travel to see your buddies, and showcase your home via StreetPass. 11-07-2017 cirno Box Text Welcome to your new life! SOMETHING'S ALWAYS HAPPENING IN THE WORLD OF ANIMAL CROSSING! Make your mark as mayor! - Keep yourself and your neighbors happy by building a town that fits YOUR style. Design your home and style your character! - Decorate and remodel to suit your sense of style. Experiment with new clothes and accessories. Nonstop fun... every single day! - Spend days and nights exploring an exciting world with your amazing new animal friends. Visit friends' towns, or have them visit yours! - Travel to see your buddies, and showcase your home via StreetPass. 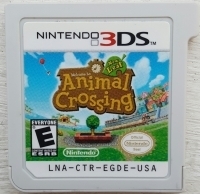 This is a list of VGCollect users who have Animal Crossing: New Leaf - Nintendo Selects in their Collection. This is a list of VGCollect users who have Animal Crossing: New Leaf - Nintendo Selects in their Sell List. This is a list of VGCollect users who have Animal Crossing: New Leaf - Nintendo Selects in their Wish List.